On the Two of Swords, we see a young blindfolded woman blocking her emotions, or someone who has put a barrier of swords across her heart. Her rigid posture tells us of her struggle to keep her feelings under control. The crossed swords are also symbolic of the need for a truce and that the problem at hand needs to be resolved using dialogue logic and intellect. The Two of Swords is a card of choice and of the difficulty of making a decision. The woman in this card is blindfolded, indicating that she is avoiding making a very difficult decision. However, the decision must still be made. Avoidance will ultimately lead to a greater conflict. 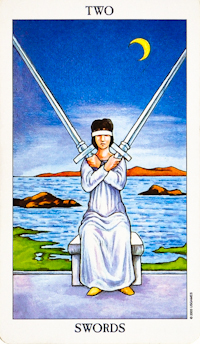 The Two of Swords is about the barriers we put up between ourselves and others and those we create within ourselves. Internally, we block off emotions and refuse to feel them. It’s a denial of feelings and emotions. This card is about miscommunication or non-dialogue. The lesson of the Two of Swords is that barriers are not the answer. We must stay open if we are to find peace of mind. The blindfolded woman in this card is also an indication that you lack the information you need to make the right decisions at this time. You may be missing something, alternative solutions, or key pieces of information. Once you are able to remove your blindfold and see the situation. Why is this decision so challenging to make? What extra information do you need? This card reflects the need for better information in your intellectual life. Ignorance makes us blindfold. refusing to look at facts, pretending everything’s fine, ignoring the warning signs, choosing not to know staying stuck, refusing to decide, refusing to acknowledge. If this is your personal card, the Two of Swords reminds you that correct decisions may come from the head rather than the heart, and that you must not let others inappropriately influence your sacred truth, and your correct path.